a paper that is truly local and run by people you know and trust. Our mission is to bring ultra-local interest stories, happenings and lifestyle content to the intelligent and affluent readers of St. Louis. 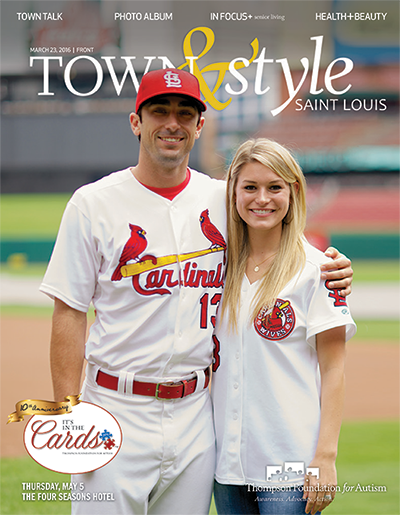 Established in 2011, Town&Style has become a hometown favorite with readers across St. Louis. Why? We deliver the kind of high-level editorial content that our vibrant and intelligent readers want. In addition to extensively covering town news, parties, charitable events and weddings, we focus on movers and shakers, school news and sports, and items of interest from the communities we serve all along the central corridor of St. Louis. Lifestyle content is centered on home, fashion, dining, beauty and health—and bringing affluent St. Louisans the very best information on what’s new locally and around the world. Our focus from the start has been on providing a mix of national magazine-level content with hyper-local news. And important for St. Louisans, T&S covers the people and businesses that make up the fabric of our community—from grade-schoolers to local entrepreneurs to active seniors—this is something readers can’t find in other media outlets. Key to our success is our creative and visionary staff. The team at Town&Style is made up of seasoned veterans of the local newspaper industry. Our extraordinary cadre of journalists, advertising representatives and creative artists has been in the business of creating and delivering high quality publications to the affluent market in St. Louis for the past 30 years. You may recognize the names of our team members, many of whom are well-known names in the community: Lauren Bry Rechan (Publisher), Karyn Williams (Editor-in-Chief), Dorothy Weiner (Editor Emeritus), Suzy Gorman (Style Photographer), Paul Doerner Principal of Lawrence Group (HomeWork), Dr. Tim Jordan (Parent Trap column), Joan Berkman (The Velvet Hammer), Charles Barnes (Photographer and Society Coverage) and Colin Miller of Strauss Peyton Photography (Cover Photographer), Wendy Krems and Wendy Jablonow (Senior Sales Executives). Town&Style is a free publication that is uniquely distributed by mail and through more than 400 pick up locations. Two-thirds of our circulation (25,500 copies) is mailed directly to homes in the most affluent neighborhoods along the central corridor of St. Louis. In addition, St. Louisans can choose from more than 400 locations to pick up the dropped copies of the paper (13,500), including all area grocers. Pick-up rates are upwards of 95%. Town&Style takes pride in being created, owned and operated by home-towners. We care deeply about this community and making sure our nonprofits, businesses, families and friends succeed. That’s the message we bring to our readers on every page of Town&Style. The reception we receive from readers shows us that we are on the right track.